I really missed you all last week, my being down with toothache and feeling sorry for myself. Unfortunately, the brain felt like it was under water, which made it impossible to think, leave alone write! But don’t you worry, I’m back and I will go to the ball! Young Benedetta has been missing quite a lot from Laura’s bar in Fiano. Then last week Laura told me that her lovely daughter was pregnant! That then explained the rather strained look on Benedetta’s face when she was occasionally behind the bar! But all appears to be well! We can now safely congratulate her and her very nice husband! It’s good to feel part of a family here, simply by being a regular coffee customer. In time one gets to know all the locals and to hear about all the family issues and news. We have been welcomed and made to feel part of a big family in Fiano. Hot Chianti wine in the sunshine. 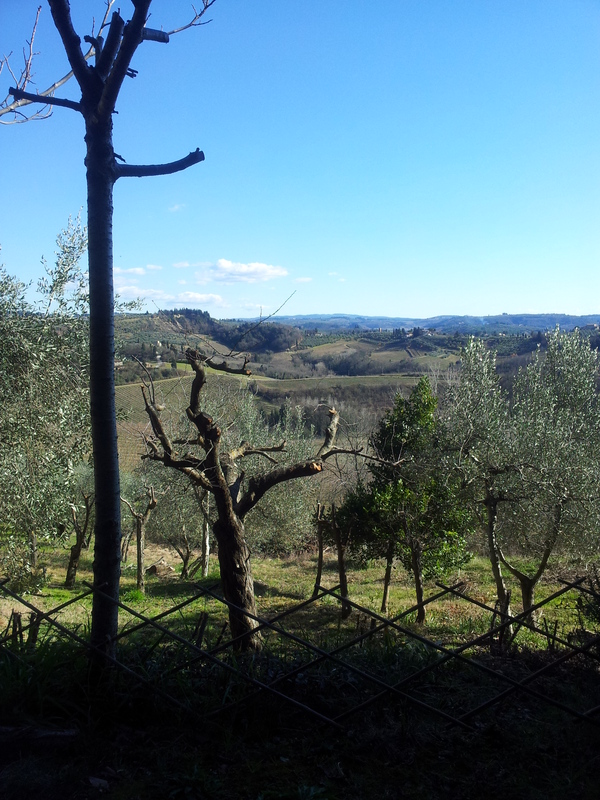 The view last Wednesday, having moved into the shade with my hot Chianti. Now, I will not labour (excuse the play on words) on my feeling sorry for my self, however, I would like to mention that last Wednesday I was feeling pretty low. I felt the need for a strong drink as my throat had also become sore. As luck would have it, the sun was shining and the wind had dropped, so I was able to go outside with a hot glass of Chianti wine. Hot you say? Well, please don’t tell anyone else, particularly Claudio who supplies our wine, but I will confess to putting my glass of vino in the microwave for thirty seconds. I know, ‘Sacrilege’ you are all shouting, and you are quite right, but Flavio my lovely doctor said this morning, that wine cures everything and I believe him! 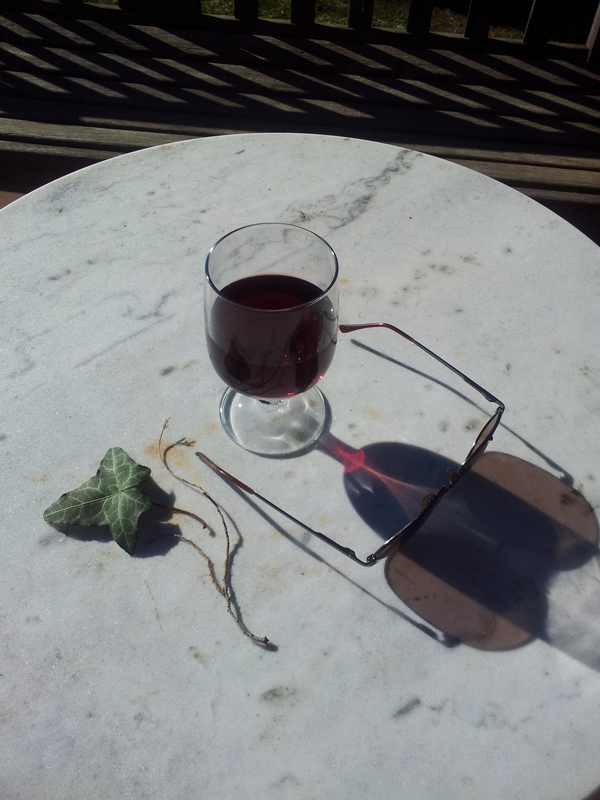 So, that Wednesday I had two large heated glassfuls and had to move into the shade as the sun had become too hot. Or was it the wine raising my temperature? Non lo so. Now, I felt much better on Friday when I went to meet my man at Certaldo station. He had travelled back from England with our fourteen year old grandson who is back for half-term. So my beautiful daughter and granddaughter were also there to greet them and we had a nice glass or two in the station bar. Valentino Rossi, Italy’s very popular motorbike champion. He is normally found wearing leather. Of course the next day was San Valentino and whilst my man is always very romantic, we do prefer to be low profile on the day. The younger Italians are very keen to celebrate San Valentino and on Sunday, when we went out for lunch at Ristorante ‘C’era una Volta,’ Paolo was delighted to tell us that he had twenty-three customers for dinner the previous night. This was an odd number, I thought, but it turned out that the odd one was a baby with a young couple. Popping back to the previous Friday morning, Laura was promoting San Valentino with some chocolaty fancy wrapped gifts. However, the bent-over old boy she was talking to was shaking his head, “No, mi non piace’ he grumbled. So I smiled and said, in Italian, ‘Do you not celebrate Amore anymore?’ His face brightened and he said ‘How about you and me?’ Serves me right of course. 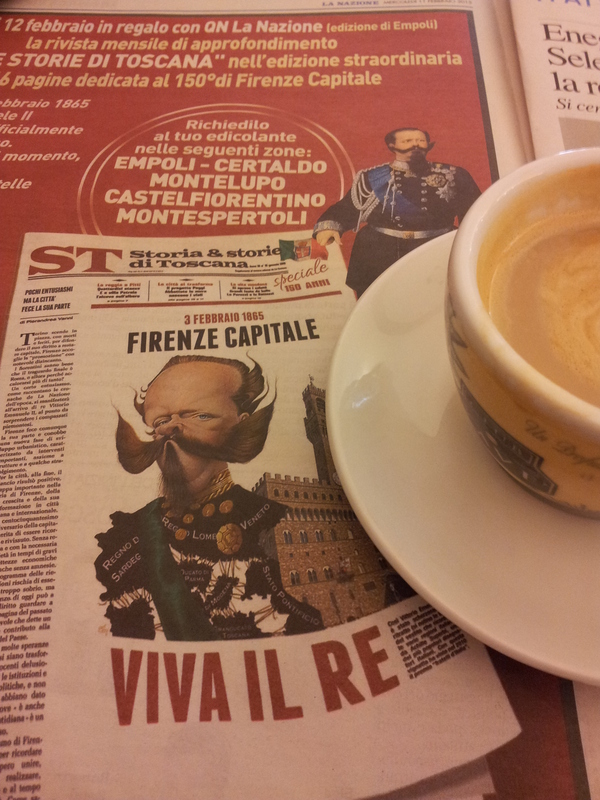 A big article in the newspaper about the last King of Italy. 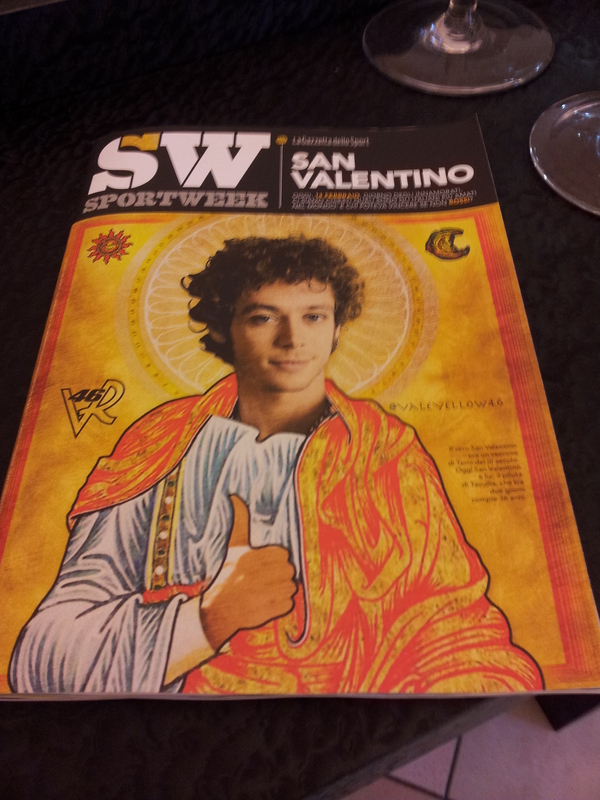 I did manage to get out for coffee every day last week and the newspapers and magazines were full of San Valentino. I also noticed that there is a celebration going on about the King of Italy who I think was dethroned by Mussolini earlier last century. Please put me right if you know otherwise. I must read up a bit more about this and perhaps visit some of the exhibitions in Florence (Firenze) that are commemorating this poor man.